This post takes its title from a famous line in The Code of the Woosters (1938) by P.G. Wodehouse: "I could see that, if not actually disgruntled, he was far from being gruntled." This is funny because as speakers of English we know that the prefix dis- means "not," so "disgruntled" clearly means "not gruntled," yet we also know that "gruntled" isn't really a word. But why not? And what about all the other funny non-words that English provides for our amusement… words like couth, sheveled, peccable, and turb? Why do we have negative words that seem to be built from nonexistent positives? In fact there are several things going on here. The first, and most straightforward, is that sometimes the positive word did exist, but has simply becomes obsolete, while the negative version survives. This is the case with feckless, from feck, (an archaic Scots form of effect.) Another example is ruth, meaning compassion, which we still see in ruthless, but seldom anywhere else. We hear about inclement weather much more often than clement weather, which is mild, but may be on its way out of the language. bruised by a hard, green back-formation. policy disgruntled everyone." But in any case, the original root gruntle was already negative, meaning "grumble, grouse," and did not mean "cheerful, content," as Wodehouse would have it. The creation of a word gruntled that means the opposite of disgruntled is a process called back-formation. That's when speakers of a language use a word thinking that it must be the root of an existing word, when in fact it's a brand new creation. It can be used deliberately for comic effect, as Wodehouse does, but it has happened unconsciously more often than you probably realize. In each of the following cases, the word that looks like the root actually entered the language much later than the word that looks like the derivative. "Excuse me, am I disturbing you?" "Not at all. In fact, I'm quite turbed to see you." "He walked into the meeting whistling nonchalantly, but when he came out he was wringing his hands and looking utterly chalant." "When I saw the dress rehearsal I thought the play was going to be a complete disaster, but opening night turned out to be an aster!" 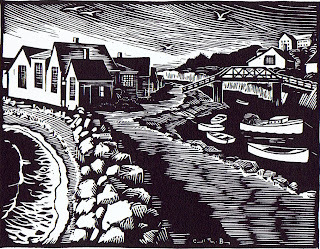 Carroll Thayer Berry (1886 - 1978) made many wood and linoleum block prints with an emphasis on the sights of Maine, where he spent most of his life. He did spend some time at the Panama Canal, and was one of the first artists assigned to the Camouflage Corps during World War I. 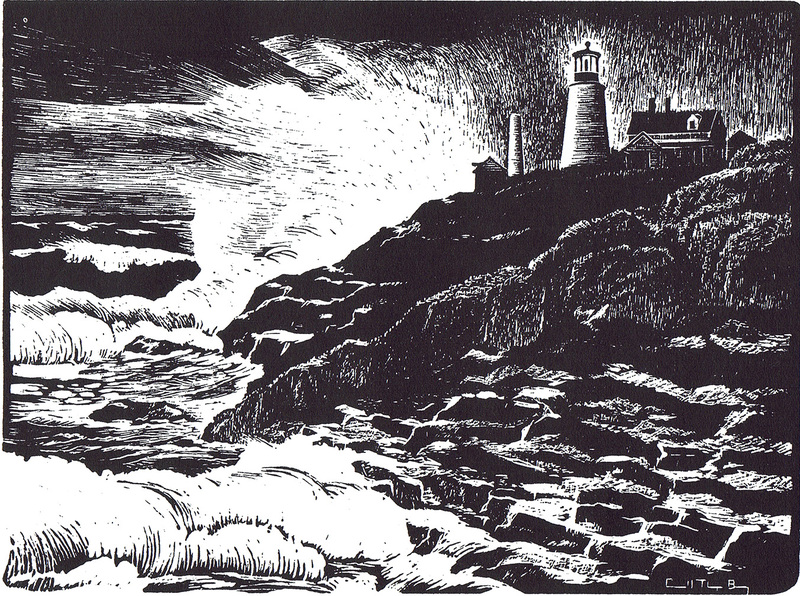 For the most part, though, his pieces depict the land- and seascapes of New England. Above is one of my favorites, with a lovely balance of black and white. It's a linoleum block print. By comparison, here's another representative piece. In this one, a wood engraving, the carving is much finer and works as shading. It makes the waves look nice and dramatic. 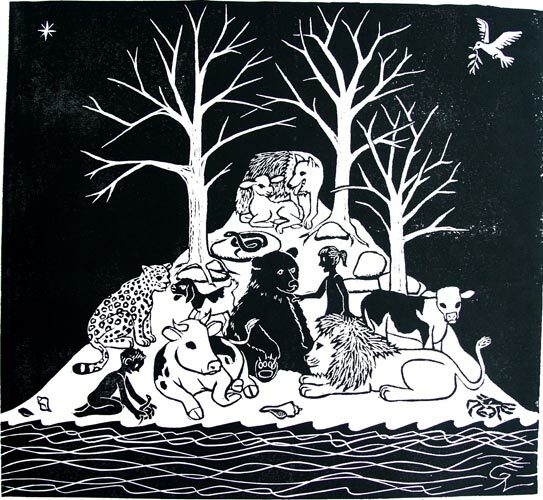 Berry developed a particular method of prints made with two blocks. One block was the primary picture, with all its outlines, details and texture. This was printed in black. But he also printed a second block in an accent color. This block had less detail and provided shading and highlights to the image. I tend not to like these two-toned blocks as much as the plain black and white ones. Partly, of course, its my standard preference for black and white. 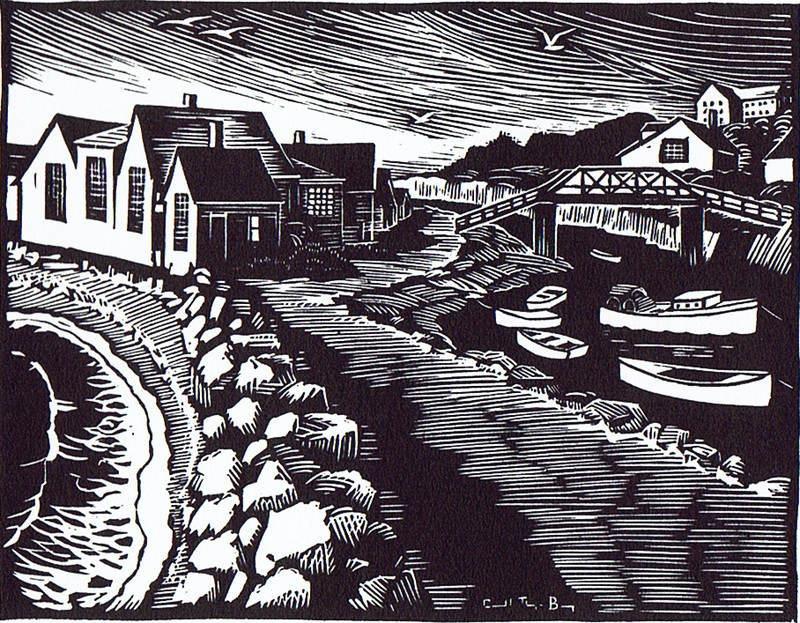 (Although I do admit to toying with the idea of doing some two-block prints myself (or reduction prints) in which I could add some grey to my palette.) But it seems to me that Berry's prints don't need this extra tone, and are not improved by it. Perhaps its Berry's choice of accent colors, which tend to look very dated to me. Frankly, I think his two-block pieces tend to look a little cheesy. 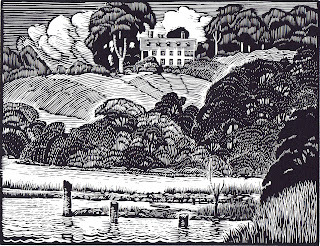 Berry's plain black and white pieces, on the other hand, I like very much. 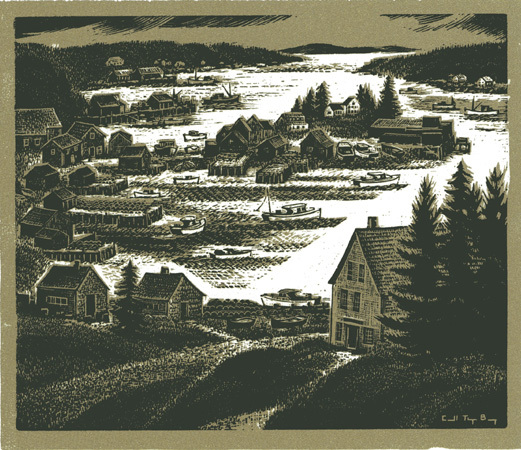 I like the scenes of pretty houses and idyllic villages and boats at harbor. 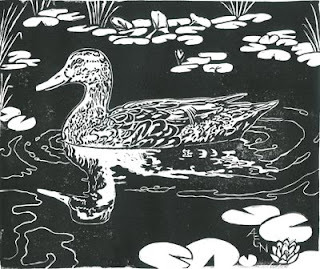 I like how he captures water with such an unwatery medium as block printing. I like that Berry seemed to be sticking to what he liked despite the tides of artistic fashion. As you may have noticed, on Saturday the world failed to end again. 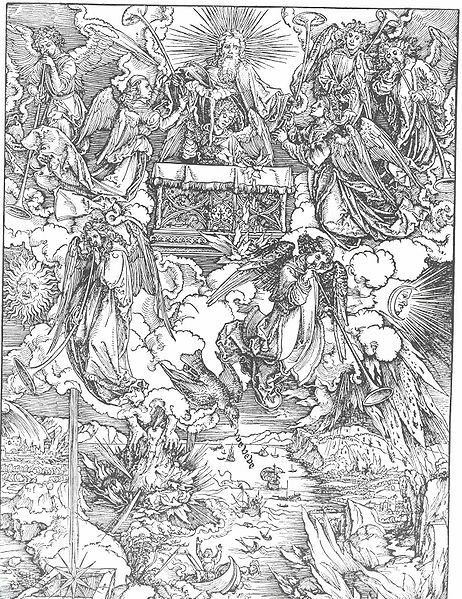 But while the "Rapture" has, in my opinion, no basis in true spirituality, my brother pointed out that the End of the World is a great topic for fantasy (as is understood very well by Tim LaHaye and Jerry Jenkins, the authors of the Left Behind fantasy series.) If you want to depict the depths of villainy and the heights of heroism which people can reach, the End of the World is surely the ultimate stage on which to see how they act. So let's check out the Nibiru fantasy. That has extra-terrestrials from the elliptically-orbiting "twelfth planet" Nibiru creating the ancient Sumerian culture… and due for another fly-by. Presumed catastrophe to ensue. It's rather sad when people try to claim that it's anything other than fiction, but you have to admit that it's classic sci fi. Nahui-Ocelotl (Jaguar Sun) - Inhabitants were giants who were devoured by jaguars. The world was destroyed. 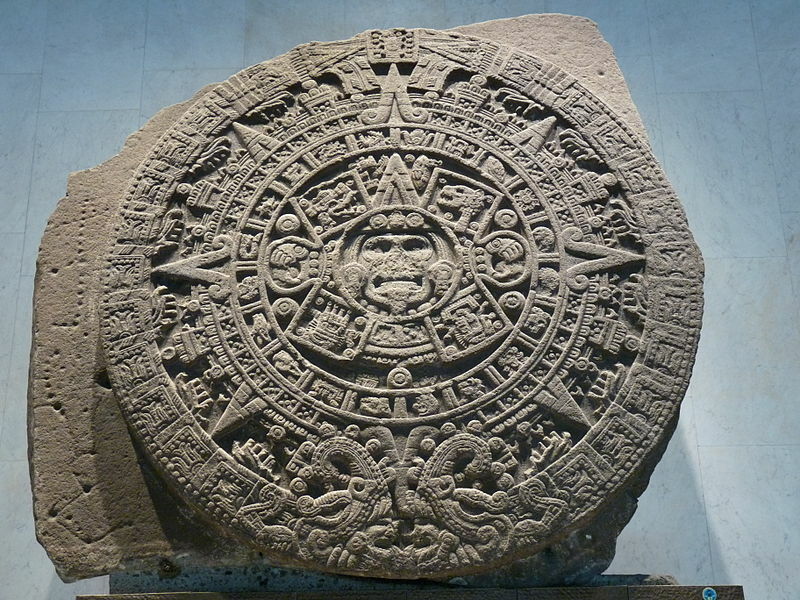 Nahui-Ehécatl (Wind Sun) - Inhabitants were transformed into monkeys. This world was destroyed by hurricanes. Nahui-Quiahuitl (Rain Sun) - Inhabitants were destroyed by rain of fire. Only birds survived (or inhabitants survived by becoming birds). 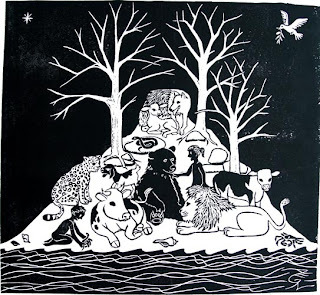 Nahui-Atl (Water Sun) - This world was flooded turning the inhabitants into fish. A couple escaped but were transformed into dogs. 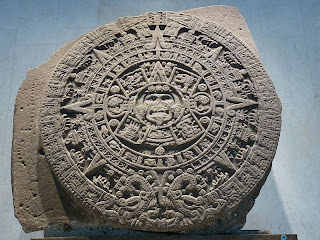 Nahui-Ollin (Earthquake Sun) - We are the inhabitants of this world. This world will be destroyed by earthquakes (or one large earthquake). 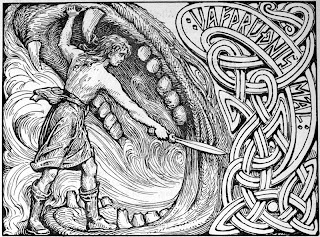 Any discussion of fantasy apocalypse has to include Ragnarök, the ancient Norse End of the World. First come three winters without any summer between them. Then Bad Stuff happens: fighting, slaughter, a lack of all human mercy… Earthquakes set free the monster wolf Fenrir, who, along with the monster serpent Jörmungandr, destroys the earth. The gods ride forth to battle, during which most of them kill each other. The entire world is engulfed in flame and/or flood. 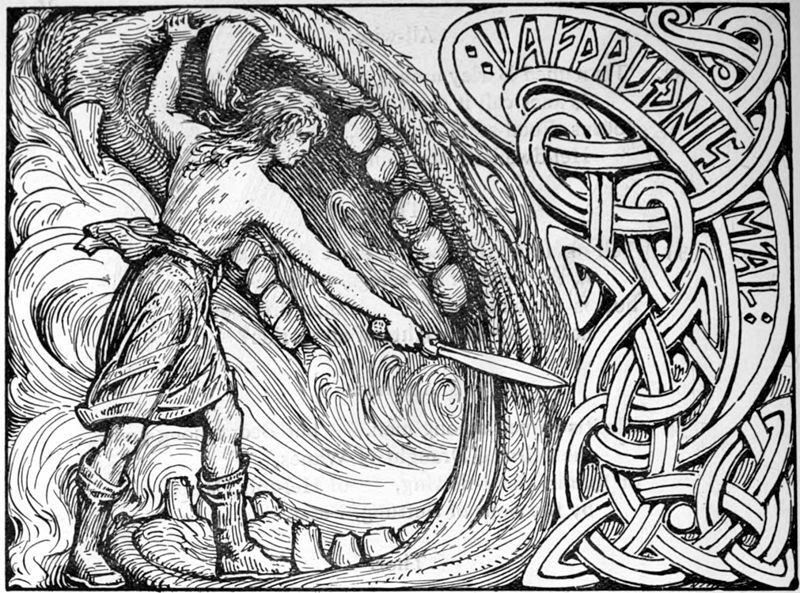 It's all pretty miserable, which is certainly consistent with the rest of Norse mythology. But some versions do allow that a man and woman and a few gods might survive, and the earth could be renewed and enter an age of sweetness and light. Hah. Fat chance. The Norse didn't know beans about sweetness or light. And then there's Douglas Adams's The Hitchhiker's Guide to the Galaxy version of apocalypse, in which Earth is destroyed by the Vogons to make way for a new hyperspace bypass. Pick your poison. The End of the World comes in many forms, all full of possibilities for interesting speculative fiction. As for serious views about the end of the world, I'm with Robert Frost. Fire and Ice, by Robert Frost, 1920.
was forced to resign by the Nazis when they came to power. She died in 1945 just before the end of World War II. 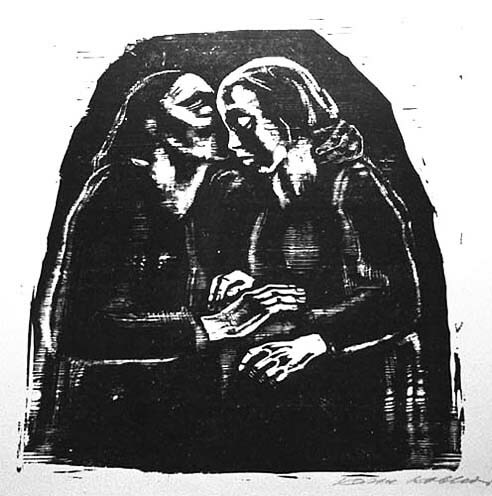 Kollwitz's radical father encouraged his daughter's drawing talent and arranged for her to have art lessons. 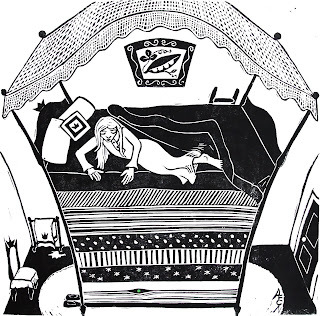 When she went to an art school for women in Berlin she decided that painting was not her strength, and began doing etchings and other printmaking techniques. A little later, looking for more strength and power in her images, she also took up woodcuts. Her prints were widely acclaimed, and her international fame and popularity were such that although the Nazis threatened her, they did not arrest her. 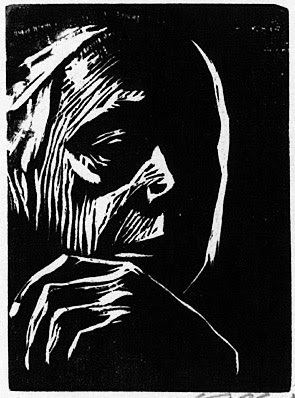 Kollwitz also made self-portraits throughout her life, so that we can see her in different moods and as she ages. Sometimes she looks beautiful, sometimes bleak. 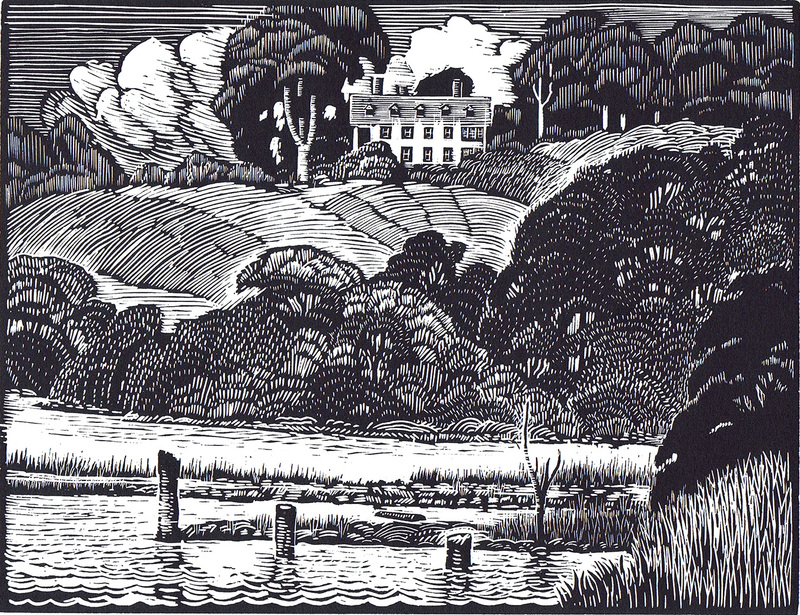 I particularly like this one, done in 1924 when she was around 57. 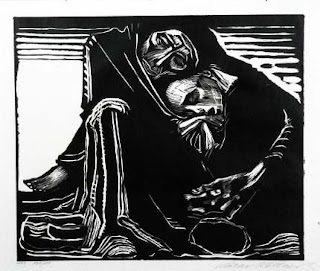 Although Kollwitz suffered from periodic bouts of depression and had so much cause for despair in the world she saw around her, she never stopped trying to use her art to wake people up to the tragedies of injustice and cruelty. "Author Visit Makes World Better Place"
I have a couple of school and library visits coming up, and I've been thinking a lot about the message I want to give kids. I don't mean what the talks will be about - that's perfectly straightforward. At the most basic level, I'll read a bit, show a bit of art, explain the process, and answer questions. But mixed in with all that, what messages will I be giving? Actually, there are a lot of messages I'd like to give my audiences, including getting them excited about my books specifically, and simply having some fun with reading, writing, and making pictures. But I think the deeper message that I'm always hoping will come through is that art can - and should - leave our world a better place. I don't mean to be pompous here, because just plain and simple fun does count as making the world a better place. In fact, I think that's really a big part of my message: that reading and writing and making and viewing art are fun, and that everyone can partake of this fun. But there's something else to this, too. Quaker sociologist Elise Boulding talked about imagination as a crucial tool for developing peace. People who envision what peaceful resolutions might look like are better able to work toward those visions. In a broader sense I believe in the power of art and fiction to envision potentially new ways of relating to the world. Now, I'm not a Pollyanna, and it's undoubtedly true that humans can also use their imaginations to hurt each other and destroy the world. Nevertheless, I do believe in the power of creativity to solve problems, large and small. I do believe that children who are encouraged to use their imaginations are better able to weather setbacks, overcome barriers, and envision a better world. And every time I talk to children about books and art, I hope that my own joy and enthusiasm can help convey that message of hope. However, I thought we needed a little variety from all the Romantic poets (of whom there will be plenty more to come, too.) So I've gathered a little bit of haiku on sci fi/ fantasy themes. Actually, haiku is a natural fit with fantasy, since an important part of the style is not just the stress count but the pithy turnaround, the twist that invites you to think about something ordinary in a new way. Often haiku evoke feelings of wonder and mystery. Some traditional haiku, while not explicitly intended as fantasy, still seem fantastical. still knocks at my gate. I've also discovered that there's a "thing" called SciFaiku. According to "The SciFaiku Manifesto" of 1995, "SciFaiku is a distinctive and powerful form of expression for science fiction. It packs all the human insight, technology, and vision of the future into a few poignant lines… SciFaiku takes its form from contemporary international haiku. A usual poem is 3 lines and contains about 17 syllables. The topic is science fiction. It strives for a directness of expression and beauty in its simplicity." this is not so hard. There's nuts and there's fruits. The showdown ends, though, when Sokka accidently puts too many syllables in a line and gets thrown out ignominiously by an outraged bouncer. Someone pointed out that in this exchange Sokka and Madame Macmu-Ling are wordbenders, and that idea really struck me. After all, what is poetry, or any kind of writing, but the ability to use the "element" of language to teach, to touch, to attack, to protect, to heal, to entertain… all the ways the benders of "Avatar" have the ability to manipulate their own elements of water, earth, fire, and air. So I'm going to keep on practicing my wordbending in the hope that someday I will be a true master. 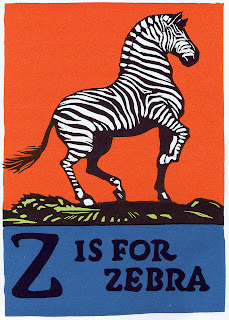 In my collection of block printed animal alphabets, Z is pretty much always for zebra. That's partly because there aren't a lot of options, of course - zebu and zorilla being all that spring to mind. 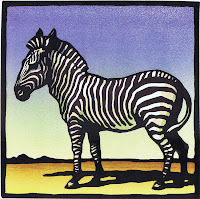 But it's also because zebras, with their graphic pattern of black and white, are practically block prints on the hoof. Here are four interpretations from alphabet books, plus a bonus zebra. 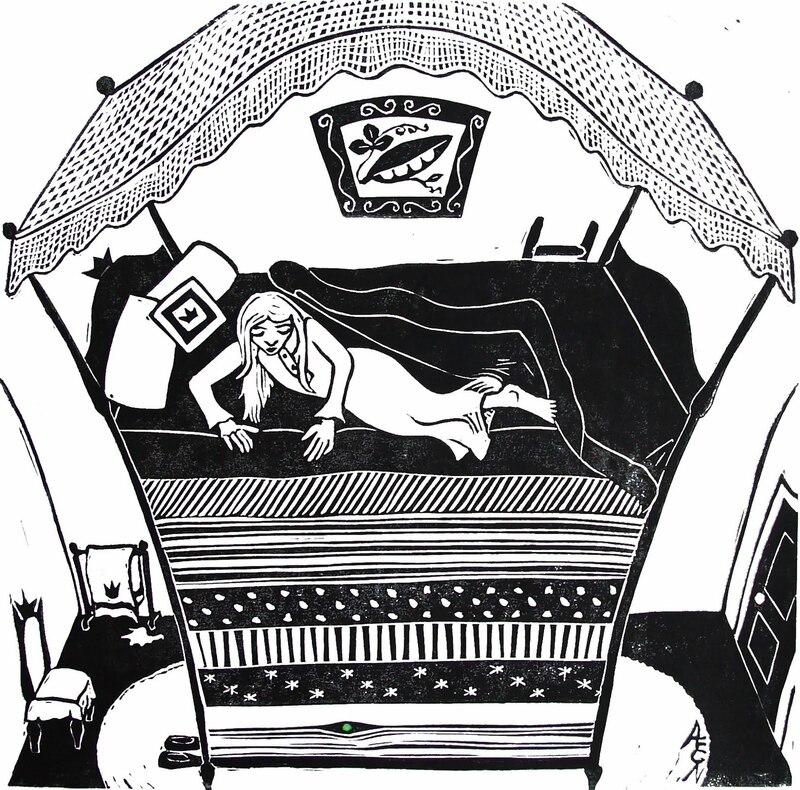 This bonus (the first one here) is by Jacques Hnizdovsky, among my all-time favorite block print artists. He'll get a post of his own at some point, but for now just enjoy the boldness and humor of his wonderful portrait of a zebra. 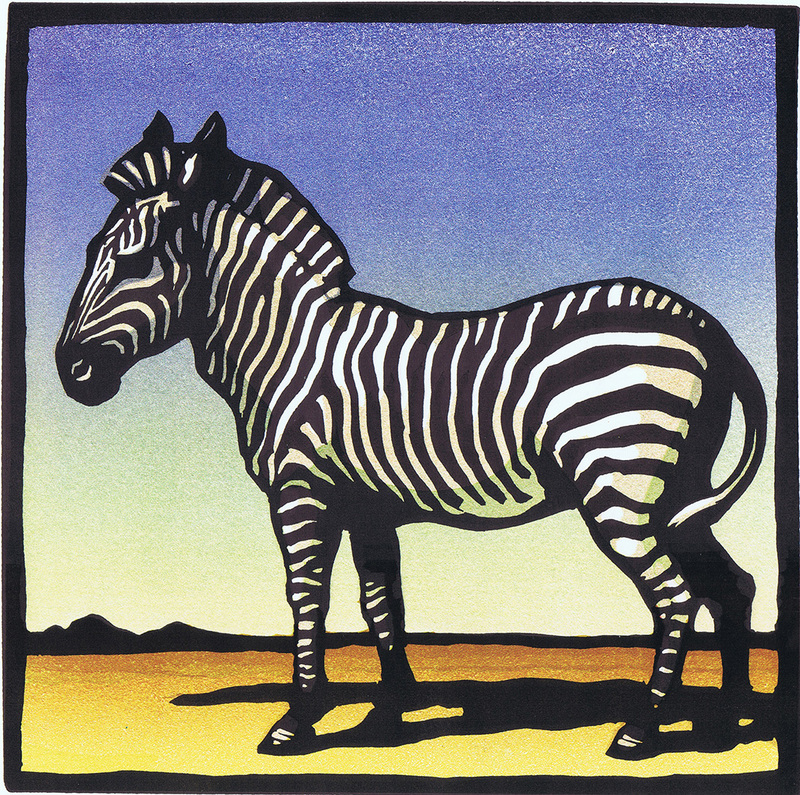 Next comes the zebra by Christopher Wormell from An Alphabet of Animals. This handsome creature's black and white are set off by the strong sunlight and deep blue sky of his background. 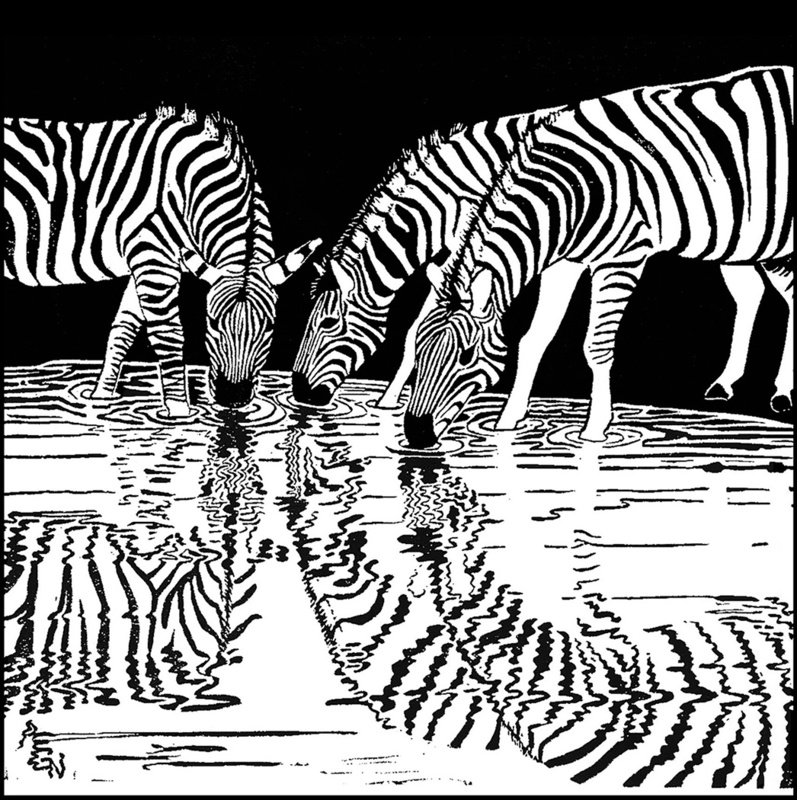 I've chosen to show not only a bunch of zebras, but to double them, too, with the reflections of their stripes in the water hole. These zebras come from my Amazing, Beguiling, Curious: 26 Fascinating Creatures, although I actually made this print long before I had any intention of doing a book… or even any expectation of completing an animal for every letter of the alphabet. And finally, here's the heraldic zebra from C.B. Falls's ABC Book. With its bold solidly colored background and ramping pose, it's a zebra any knight could be proud to show on his standard. 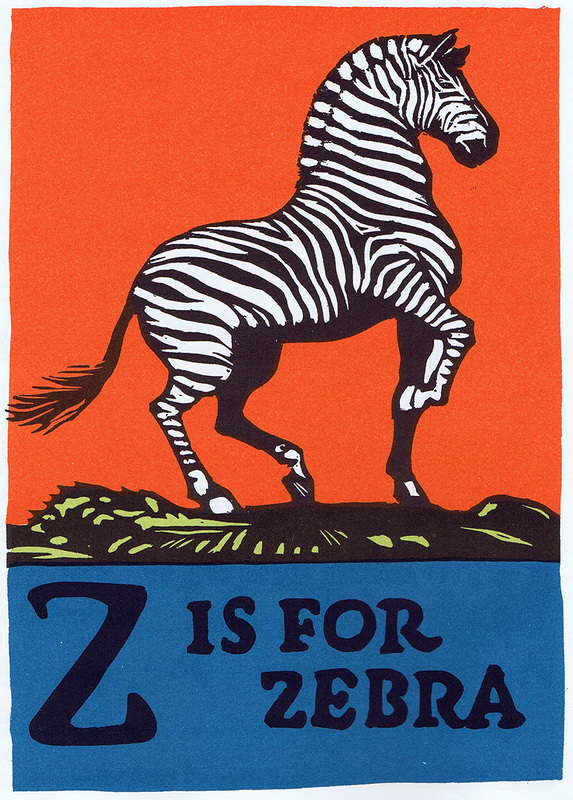 Five interpretations of Z is for Zebra, and each one unique! 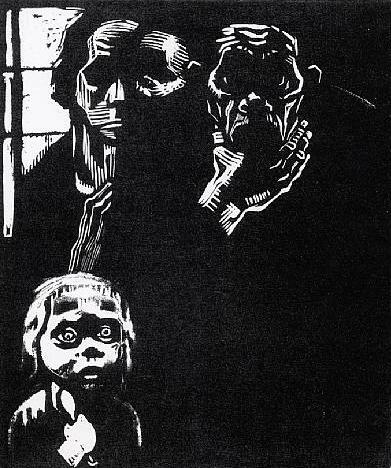 I love how different artists can interpret the same straightforward subject in such wonderfully different ways. There are black and white renditions, black and white with colored backgrounds, and fully technicolor. There's zebra in profile, zebra from the front, zebra cropped, and zebras multiplied. 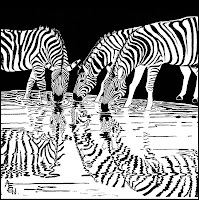 There are realistic zebras, stylized zebras, and totally imaginary zebras. Five ways of looking at a zebra. 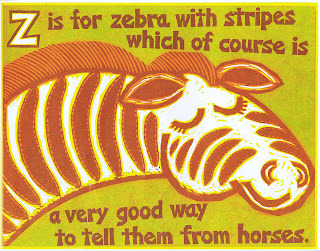 Never again think of "Z is for zebra" as just a boring old cliché! With Mother's Day coming up it seems a good time to think about the role of mothers in fantasy… except that the most notable feature of mothers in fantasy is their absence. Orphans and motherless children abound in fantasy, and there are some very good reasons why. Missing parents simultaneously give a hero trouble to overcome and the freedom to have adventures, both of which are necessary ingredients for a good fantasy tale. But while absent mothers are often dreams of lost perfection, the mothers that manage to stick around in a story are all too often problematic. We can start with Cinderella by way of illustration. Cinderella's mother is a paragon of love and virtue, and (in some versions) leaves her daughter with certain protections even after she dies. Then there's the stepmother. Let's talk about wicked stepmothers. I read somewhere a theory that all those wicked witches were originally birth mothers, but were changed to stepmothers to make the stories one step less horrifying. Whether or not that's true, the death of mothers of young children has certainly been all too common throughout most of history, and when marriage was primarily an economic arrangement it doesn't seem too hard to believe that there would have been plenty of stepmothers with no particular affection for their stepchildren. Of course, the same would have been true of stepfathers, so why the stepmothers always get the bad rap is a rant I won't go into right now. Suffice it to say that wicked stepmothers - and wicked aunts and uncles and other wicked legal guardians - are a staple of fantasy from Grimm's fairy tales to James and the Giant Peach to Harry Potter. …errrrr… Really, I'm stumped already… Can anyone think of any other good mothers? Any at all? I admitted that absent and unkind mothers make an easy set-up for a fantasy adventure, but even so, the more I notice the genre's motherlessness, the more I begin to wonder why all writers seem to hate their mothers - or assume that all readers hate theirs! I've made a point of putting some smart, interesting, sympathetic mothers into my books. Kate and Sam's parents, although they are carried off by a dragon, do not disappear from the story to passively await rescue by their heroic children. No; they both display courage, creativity and knowledge along with their concern for and confidence in their children. I knew that my own children, for whom Kate and Sam to the Rescue was originally written, would relate at least as much to active, loving parents as they would to cruel or absent parents. And I remain convinced that my kids aren't the only ones who do! Naturally I like to think that I'm a pretty good mother myself - according to the criterion of one advice columnist, I've never hit P or T over the head with a frying pan, so I'm doing fine. And I certainly know that my mother was and continues to be perfectly Splendid. 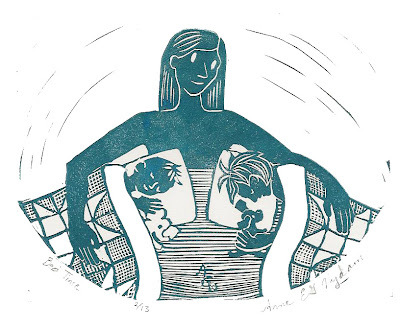 So I'd like to see some more fantastic fantasy mothers: more smart, loving, interesting, active, sympathetic mothers, raising smart, loving, interesting, active, sympathetic heroes… And perhaps a little more recognition that being a good mother can be a pretty heroic adventure in itself.